Good News! The newly announced Zeiss ZX1 full frame fixed Lens camera is now listed at B&H! The price is not released yet. Full-frame 37.4MP CMOS sensor enables recording high-resolution stills at up to 3 fps and 4K30p video, along with a sensitivity range of ISO 80-51200. Built-in ZEISS Distagon T* 35mm f/2 lens has been perfectly matched to the sensor in order to provide edge-to-edge sharpness and illumination. The optical design incorporates two double-sided aspherical elements, which help to reduce spherical aberrations and minimize distortion. Additionally, the bright f/2 maximum aperture is suitable for low-light shooting and also offers increased control over depth of field. Leaf shutter design provides flash sync at all shutter speeds and allows for especially quiet shooting. A 255-area AF system is available, and can be used in conjunction with single-shot or continuous AF modes, or DMF and MF modes can also be used. Physical shutter speed and ISO dials, along with a manual aperture ring on the lens, afford direct, intuitive control over exposure settings. High-resolution 0.7″ OLED electronic viewfinder has a Full HD resolution along with a 0.74x magnification for clear, bright viewing. Rear LCD incorporates a side tool bar for quick switching between four distinct camera modes. Microphone and headphone jacks can be used for enhanced audio recording and audio monitoring while recording video. Top hot shoe is compatible with the Sigma TTL flash protocol. Based on a large, 4.34″ rear LCD screen, on-the-fly image editing is possible. The HD (1280 x 720) screen has a 338 ppi resolution and is touch-sensitive for intuitive navigation and editing control. The spacious screen is also the perfect place for in-depth review of your imagery while out shooting. The distinct shape of the camera body, which has a bend in the middle, allows for an easy-to-find groove in the screen where the touch-sensitive tool bar is located. Integrated Adobe Photoshop Lightroom CC allows for thorough editing capabilities directly on the camera. This sophisticated software lets you adjust everything from exposure and color to making selective edits or syncing your edits to Lightroom CC on your computer. A wide range of sharing capabilities are possible, including both wireless and wired means to help you quickly and efficiently get your photos out to the world. Built-in Wi-Fi with NFC and Bluetooth connectivity let you seamlessly share images directly from the camera to a linked device. USB Type-C interface can be used to port images directly to an external hard drive, share a live view of the camera to an additional screen, or an external battery pack can be used to power and charge the internal battery. Integrated 512GB SSD allows for storing a huge amount of photo and movie files without the need to swap memory cards. On the camera, files can be organized into different collections for easier navigation. Wireless connectivity lets you upload your files to cloud storage services directly from the camera. Automatic backups are possible to your own NAS system and remote access to the files is also available from wherever you are. Firmware updated can be downloaded and installed or updates over-the-air are also possible. 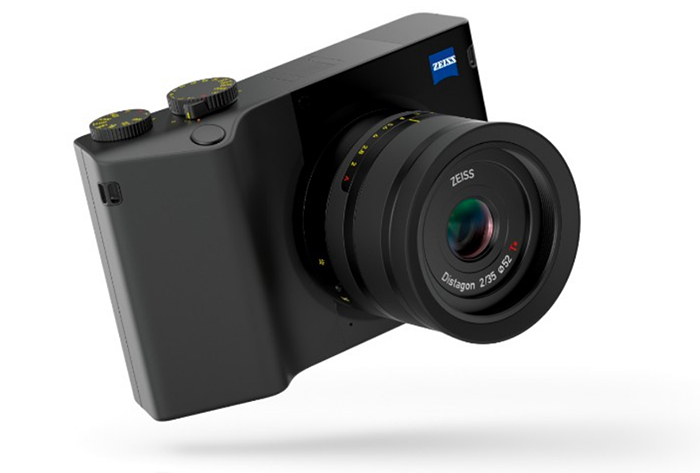 This entry was posted in Zeiss Camera and tagged Zeiss camera rumors, Zeiss ZX1 on October 6, 2018 by admin.